The management and design team that brought the industrial world a new generation of worker safety devices manufactured out of Calgary is back together, doing to portable gas detection what the smartphone did for consumer communications. Blackline Safety recently introduced the world’s first wireless gas detector with 3G wireless, two-way speakerphone and live monitoring capabilities, bringing the wearable gas detection sector to the digital age. In effect, the sleek G7 combines a gas detector, a lone-worker safety device and a communications tool into one high-tech wearable device. “If you look at the world today and what technology has done—it’s brought us wearables, it’s brought us connectivity, it’s really changed almost every aspect of our lives,” says Cody Slater, Blackline’s chair and chief executive officer. The G7 was designed to do just that. 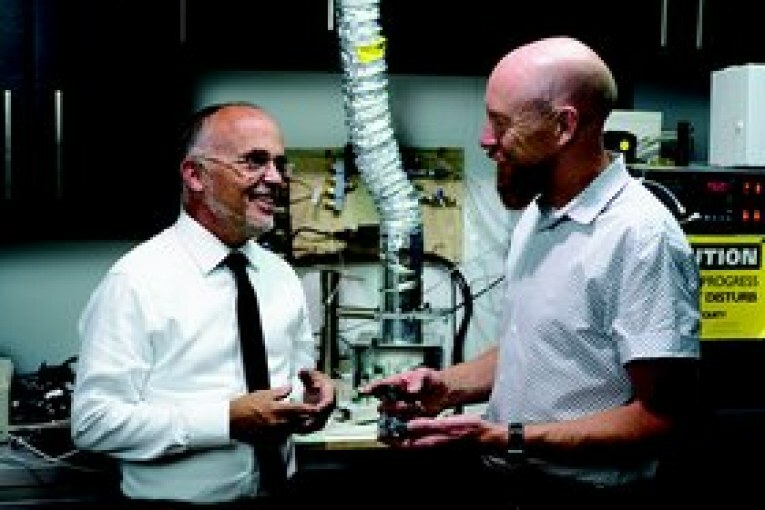 Slater has a track record that dates back to his days at the University of Alberta in the 1980s, when he took a leave of absence from his studies in astrophysics to try his hand at improving the gas detection technology of the day. When a friend who worked in the oilpatch showed him the devices then in use—designed for a plant setting and adapted to use on drilling rigs—he knew he could do better. He founded BW Technologies and produced the first solar-powered wireless gas detection system for drilling rigs, the Rig Rat. It was only the tip of the iceberg. He and his growing team went on to produce several innovative portable gas detectors and grew the company rapidly, creating a product line of more than 30 unique devices and growing to 350 employees with offices established around the world. BW realized annual revenue growth of 40 per cent for six years running as resource industry companies, municipal governments and firefighting brigades adopted the technologies. Like this? Read all about the people and tech advancing Canadian oil and gas every month in Oilweek. Combining user-friendly aspects with functionality, the innovations that fuelled the company’s rapid growth included producing the first zero-maintenance portable gas detectors and originating the use of multi-layered electronic circuit boards to shield the circuitry from radio interference—which had the added advantage of enabling a more compact and appealing design. The company’s local manufacturing also saved costs and enabled new product turnaround times that kept the company ahead of the technology curve. The innovations earned the company and its principles several awards, including Slater’s selection as one of Canada’s Top 40 Under 40 in 2002, one of Alberta Venture’s 50 Most Influential People in 2004 and an EY Entrepreneur of the Year. The accolades also brought the attention of competitors—BW was snapped up in 2004 in a $260-million acquisition by First Technology, which was purchased by Honeywell two years later. BW remains a subsidiary of the New Jersey–based multinational, though it has moved its manufacturing out of the country. Blackline, which brought back much of the team from BW, is hoping to duplicate that success with a similar technology-driven strategy. In its modish facility that combines a return of local device manufacturing with research and development and software development studios that would not look out of place in Silicon Valley, the new company has produced the latest step change in gas detection technology with the G7. The company calls the wearable device the world’s first fully connected, work-anywhere safety device with expandable gas detection capability. “It’s quite different from the way traditional gas detectors work. They are normally autonomous, and they aren’t connected to any back end, so they don’t do any real-time reporting, and there is no real-time awareness of what’s happening with that device,” says Barry Moore, Blackline’s vice-president of product development. In that respect, traditional detectors are like smoke alarms, alerting only the wearer and those in earshot of potentially hazardous situations. Wireless connectivity and live monitoring provide the added level of connected safety monitoring to supplement gas detection. Here, live monitoring is a real differentiator. In its Safety Operations Center, Blackline’s monitoring team is able to react instantly to safety incidents, whether triggered by a gas alert, a worker fall or lack of movement, a missed check-in or a worker-activated SOS latch call for assistance. For example, in the case of a hydrogen sulphide exposure, a risk when dealing with sour gas, in addition to sounding its alarm and flashing its lights, the G7 simultaneously communicates any readings above pre-set thresholds to monitoring personnel. They will then remain in touch via the device—which has a two-way speakerphone as well as texting capability—even if the worker cannot respond. Operators have instant access to a live monitoring portal with an interactive Google map platform that displays the worker’s location and the location of any co-workers in the area, who can be alerted to the location of the incident or evacuated if necessary. Instant communication can be established with the company’s relevant personnel and first responders in the area, who can be directed to the precise location of the incident. Inside a multi-storey building, where GPS may not be able to distinguish the storey or room in which an incident occurred, an indoor beaconing system can be deployed to provide that level of accuracy. There are other built-in benefits as well. “The real-time awareness when it comes to alarms provides obvious advantages, but it also gives us real-time awareness of compliance so that you know which employees are actually using the device, whether the device is functioning properly, and we can look for any kind of issues with the device and notify the appropriate people with that information. We can track all the calibration and bump testing of the instruments [for which over-the-air reminders are provided] in real time,” Moore says. All safety incident and gas alert data is recorded, which is useful for compliance purposes and to allow companies to assess and learn from potentially life-threatening situations. Blackline Live, a cloud-hosted monitoring account, provides the tools to monitor workers from any internet-connected device. It also facilitates geo-referencing of gas readings over time, enabling Blackline to produce a heat-map identifying minor leaks and allowing remedial action to be taken to fix them before they become a bigger problem. Also new is the decoupling ability of the gas detection sensors from the rest of the unit using interchangeable cartridges. Single-gas or quad-gas cartridges are available, customizable according to customer needs. Target gases include hydrogen sulphide, LEL (lower explosive limit of combustible gases), carbon monoxide, CO2, oxygen and ammonia, with more under development. “The advantages to that are, from a service standpoint, you can just switch a cartridge out [when it’s beyond its service life] and carry on working. The cartridges carry all the calibration information so you can have a calibrated, ready-to-use cartridge available whenever somebody needs it—and the customer can select for whichever target gases they were looking for,” Moore says. By leveraging 2G/3G cellular and Iridium satellite technologies, connectivity is not complicated by Wi-Fi network interface or Bluetooth connections to another device, he adds. Firmware updates occur automatically and wirelessly. The G7’s lustrous design was enough to earn it the prestigious Red Dot Award: Product Design in April. It was chosen over some 5,500 submissions from 54 countries for its combination of innovation, functionality, ergonomics, durability and overall quality of design. “The hallmark of any good design is one that enables users to do new things without thinking too much about it,” says Moore. Corrpro Companies, a provider of cathodic protection systems and engineering services, sees Blackline as the technological leader in the safety industry, according to Todd Brabson, vice-president of health, safety and environment for Aegion’s Corrosion Protection platform. “Their client interface is exceptional, from onboarding of our employees to addressing every alert. The company is very professional as they are with you from start to finish. Blackline Safety is our business partner—they share our value in taking care of our greatest asset: the health and wellbeing of our employees,” Brabson says. It has been estimated there are more than 50 million lone workers in Canada, the U.S. and Europe alone—a huge market for a product line that offers an edge over its competitors. In the oil and gas industry in particular, the fatality rate is seven times greater than the rate for all U.S. industries, the U.S. Occupational Safety and Health Administration reported as recently as 2014. Where emergency response times can be a matter of life and death, technology that trims that time can be a lifesaver.